These Pumpkin Caramel Bars with Bacon are the salty-sweet dessert combination you have been craving. With bacon sprinkled on top and drippings in the pumpkin layer you are in for a treat. 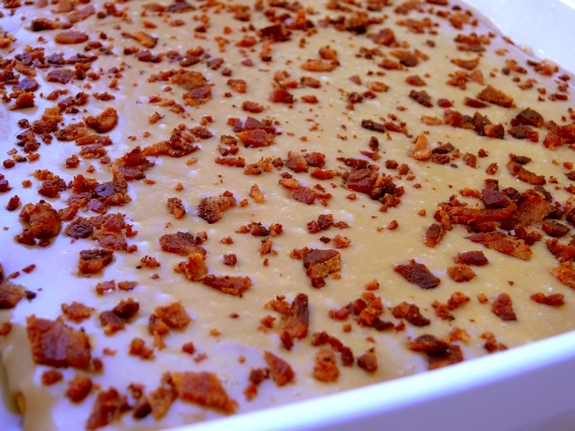 How to take pumpkin bars to the next level…add caramel frosting and bacon. This sure beats the regular cream cheese frosting we normally use with pumpkin desserts. The bacon adds a smoky, salty and crunchy complement, while the bacon drippings in the pumpkin layer add another subtle smoky taste. I have come to love bacon in my desserts, especially these cookies and this cake. They just exude that sweet-savory flavor I love. The caramel frosting in this recipe is a take on Italian buttercream, however, the method is actually easier and the results are “perfection”. Total perfection!! Overall this is a great fall dessert. It would also go nicely as part of a Thanksgiving Day holiday dessert table. Thank goodness these need to stay in the fridge, otherwise I would be grabbing one off the counter every time I passed by. Wouldn’t you? Preheat oven to 350o F. Coat a 9 x 13 baking pan with nonstick spray. Cook bacon in a saute pan over medium heat until crisp; drain on a paper towel lined plate and set aside. Reserve two tablespoons of the drippings. Whisk together flour, baking soda, cinnamon and table salt for the bars in a medium bowl; set aside. Whisk together pumpkin puree, granulated sugar, 1/2 cup brown sugar, egg, melted butter, bacon drippings and vanilla in a large bowl until well blended. Stir in flour mixture and pecans. Spread pumpkin batter evenly into prepared pan; bake until a toothpick inserted into the center comes out clean, about 20 minutes. Let cool completely before frosting. Boil two cups brown sugar, water and a pinch of salt for the frosting in a large saucepan over high heat, 5 minutes, swirling occasionally to prevent scorching. Whisk in cream and butter pieces. (Mixture will bubble furiously; keep whisking.) Boil 2 minutes more. 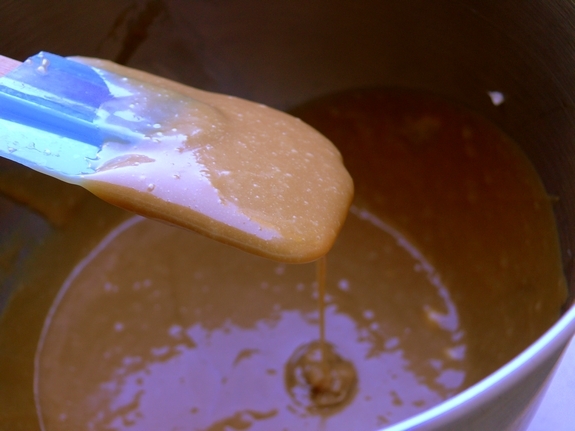 Transfer caramel to the bowl of a stand mixer; whip on high speed until sides of bowl are cool to the touch and caramel is thick, 10-minutes, scraping down sides of bowl as needed. Add cream cheese, one cube at a time, until frosting is smooth. Frost cooled bars. Finely chop cooked bacon and sprinkle onto frosted bars with sea salt. Place in the refrigerator to set frosting for one hour. They keep in the fridge for up to one week. Preheat oven to 350 degrees F. Coat a 9 x 13 baking pan with nonstick spray. Cook bacon in a saute pan over medium heat until crisp; drain on a paper towel lined plate and set aside. Reserve two tablespoons drippings. Boil 2 cups brown sugar, water and a pinch of salt for the frosting in a large saucepan over high heat, 5 minutes, swirling occasionally to prevent scorching. Whisk in cream and butter pieces. (Mixture will bubble furiously; keep whisking.) Boil 2 minutes more. Transfer caramel to the bowl of a stand mixer; whip on high speed until sides of bowl are cool to the touch and caramel is thick, 10-minutes, scraping down sides of bowl as needed. Add cream cheese, 1 cube at a time, until frosting is smooth. oh my god, i just died a little bit. these look incredible. Died and gone to heaven. My October just got MUCH better! These sound so different that I almost have to try them, especially the way you’ve raved about them. Is it absolutely necessary to use a stand mixer to whip the caramel? I only have a portable one. Okay, Cathy. This is why I just passed you a ‘versatile blogger award’ … these look truly decadently delicious! And … keep up the good work! Saw these in my issue of Cusine at Home and made them last week… sooooo goooood! Bacon and caramel… how could anything be better? Very unique recipe. Look really delicious ! While I’ve tried bacon on a few sweet things, and don’t really care for it, I love how dense these bars look! Oh Cathy…the bacon just puts it over the top!!! I am drooling over here! Oh my goodness!! I have died and gone to heaven. These look fantastic. I am definitely making these for the holidays and maybe before then. Thanks for the post. OK, I love bacon and I love caramel, and I love pumpkin desserts (except cheesecake, which I hate! ), but I’m not entirely sure I can handle putting it all together. I tried a caramel apple with hot crispy bacon on it, the other day and it was unique, but…I don’t know. Not sure I like the combination. Aside from the bacon, these bars look wonderful!!!! Hmmm. I just don’t know. That’s a pretty long time to be mixing with a portable mixer on high speed…could take even longer…might burn up the motor??? Bacon and Caramel and Pumpkin? TRIFECTA! Think I’ve found the perfect savory snack to try this fall…thank you! Caramel and bacon goes so well together, especially this time of year. I am now ready for October and November! This looks incredible! Oh man. I’m going to make these but will have to omit the bacon as I have vegetarians in the family. I hope they’ll be just as awesome. Oh my gracious!! These bars look amazing! Doesn’t bacon make everything better? Very very interesting! I bet this is good, the caramel frosting looks amazing. you took the words right out of my mouth.I fell on the floor laughing when you mentioned the corn. That is a running joke in our house: “Can we put corn in that? Wow, these look incredible. I am going to have to try a gluten-free version for sure! Everything is better with bacon! Made these last night. My frosting didn’t turn out as thick as your pictures. But it has gotten good reviews. I don’t usually like pumpkin but I thought these tasted great!! I’m not entirely certain I can reconcile myself to bacon in my dessert. But, then…it’s bacon! I made these for a tailgate party on saturday. They turned out GREAT! Everyone loved them – once they got past the “what are they?” & “is that bacon?” My husband had at least 4 – he said he would have a beer, eat a square…then repeat! Your directions were (and always are) very thorough. I changed nothing other than to add a bit of grated nutmeg. Thanks for making me the hit of the tailgate! you vixen! this is simply outstanding. my newfound love of pumpkin combined with my eternal love for bacon make this a winner to me! Now these must have been fabulous. Wow, what a great recipe. Just made these for Halloween dinner – everyone is loving them!!! Oh my lanta – my sister made these this weekend. I do not like cream cheese frosting (I believe I am the only one in the world who doesn’t), but these were truly perfection. I don’t use that word lightly either. Absolute PERFECTION. I made these for a friends Halloween party and they were a hit! Absolutely delicious! I plan on making them for a Thanksgiving treat as well!! Yum yum!! Oh my! This looks divine in so many ways! What a wonderful combination of flavors. We were both featured in the “Ten Tasty Food Blogs You Should Be Reading” at Jam Hands, so here I am reading and enjoying! I just made these last Saturday. I have a question. When I made the frosting, the recipe says to boil for 5 minutes over high heat, which I was a little scared to do, so I boiled the sugar mix for 5 min over med high heat, swirling it around occasionally to prevent burning, just as you state in the recipe. It came out very dark, on the verge of being burnt, when I stuck it in the stand mixer, it harden to a rock on the sides as I whipped it. I have no idea what I did wrong, because I followed your recipe to a t, except reduced the temp to med high. They were wonderful, except for the very dark frosting that almost tastes burnt. I’ve been cooking and baking for over 35 years, so I don’t think it’s anything I did wrong, but then again, I might of. So I’m wondering if you ran into this at all? Your frosting in the picture is beautiful and want mine to look like that! Thank you!! Hmmm, never had that happen with this recipe but have done something similar when working with sugar for other recipes. All of our stoves are different and sounds like even med-high was too hot for your stove? At first I was not sure about this recipe. Tried it. Great. Glad I did. I added your link to my blog, Baking is my Zen. This recipe is from Cuisine at Home. I subscribe to this magazine and have found their recipes to be fantastic. The Pumpkin Bars with bacon are awesome! You are right and we do credit them in the post for their awesome dish. These look amazing! I’m making them for a bake sale next week. I hope I don’t eat them all first! I love bacon in my desserts too. And also in my donuts.